Rob: Owen, my first reaction to Foul Balls was pretty simple: Why did it take me nearly 30 years to read this book? Now, I’m sure it’s partly because the book was marketed mostly (entirely) in Canada; my mass-market paperback was published by General Paperbacks, a Canadian company previously unknown to me. And maybe it’s partly because the book is Blue Jays-centric, and the Jays have never been a subject particularly compelling to me (although in my defense, I have consumed the memoirs of both Dave Stieb and Ernie Whitt). This is just good baseball stuff, though. Of course it’s a dirty little secret that many and perhaps most good baseball reporters aren’t actually much good at writing. Which doesn’t stop many of them from becoming columnists. But that’s another story. Well, I don’t know if Alison Gordon was a good reporter, but she could damn sure write. The opening of Chapter 1: "The ghosts all come out on opening day, lurking happily in the outfield corners, floating through the dugouts, raising small eddies of red-clay dust around second base, settling into the bleachers with the flesh-and-blood paying customers." Owen: Did you ever, as a child, spend time fantasizing over an illustration of a treasure pile? You know, like a big mountain of gold and gems and necklaces and so forth, the kind that we always see Smaug coiled atop in versions of The Hobbit with picture plates? I used to love pictures of treasure piles, imagining running my hands through and picking out just one fabulous bit of plunder. Alison Gordon’s Foul Ball! Five Years in the American League is one of those special books that give me the same feeling those pictures of fabulous, littered riches used to give me as a kid. I just want to wallow in her writing. Her perspective – witty, fearless, super smart – is one I’d happily follow into any subject. Lucky for us, her subject was baseball. And Gordon shows the reader so many other things that other baseball books – at least the ones I’ve read – don’t show. To take the example that forever sealed my devotion: in the course of an early chapter’s frank and roaming treatment of the personalities and lifestyles of major league ballplayers, Gordon describes how Blue Jays outfielder Jesse Barfield once requested a meeting. "I agreed," Gordon writes, "hoping that he wanted to talk about demanding a trade or to complain about the manager off-the-record…" Instead, and to her chagrin, Barfield’s actual purpose is to convert her. As he reads Bible verses to her, she reflects, "Here I was, a reasonably intelligent and well-educated forty-year-old woman being lectured by a born-again ballplayer young enough to be my son." Eventually, her (justifiable) annoyance gives way to remarkable generosity: "It was really a very loving gesture… Because it was not in a form with which I was comfortable did not make it any less thoughtful." But then there is this kicker of quote from Barfield, his apparent motivation in arranging the meeting with Gordon: "’I was reading the Bible… on the way here. I looked around at the other people on the plane and as I looked at each one I realized that he was Hell-bound. There were only three of us who weren’t Hell-bound.’"
Cue the great Ned Martin: "Mercy!" Gordon portrays the game as it is: bizarre and gritty and amazing. Yes, I agree that this is a special book, and my fantasy is that our conversation will find someone out there in publishing and inspire that person to dig out the rights, wherever they may lie, and bring it back into print. Which brings me back to your initial question, how the heck is this book out of print? That the Blue Jays teams she writes about topped out at 4th place (in 1983) may well be a factor. It makes it hard to pitch – i.e. "You’ve got to read this great book about a middling baseball team!" I suppose the elephant in the room is that Gordon, the first female major league beat reporter, was ill-treated by a lot of people in the game – in the locker room and in the press box – and she names names. Do you think that has something to do with it? What about the book surprised you? Did you really read Dave Stieb’s biography? 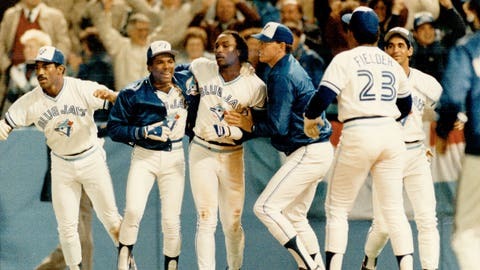 Rob: Well, I think I read Stieb’s autobiography. I definitely have Stieb’s autobiography. I know I read Ernie Whitt’s, just a few months ago. He was shockingly honest about a bunch of the pitchers he worked with. That’s another thing I liked about Gordon’s book. Without telling tales out of school, and while seeming fair throughout, she’s got some pretty unflattering things to say about Stieb, and Reggie Jackson, along with some guys — Barry Bonnell, assorted Yankees — who gave her a rough time on the job. Then there’s the story about the player who offered Gordon $200 to go to bed with him, because his teammates had offered him $500. Lovely. What surprised me? Just that it’s so damn good, really. I mark up books, especially baseball books, with a pencil, usually putting a star next to a good sentence or two, and a wavy line next to a notable passage. Well, I gotta lotta stars and wavy lines. It’s certainly not surprising that most of the players Gordon covered were in a state of arrested adolescence. Which made the passages about the more mature players — Jim Gott, John Mayberry, Willie Upshaw, Lloyd Moseby — all the more refreshing. In my first two years on the beat, my membership card in the all-important organization read "Mr Alison Gordon," the title being a permanent part of the card, printed to the left of the space for the name. I asked Lang at the end of the 1979 season when the "Mr." was going to come off the card. We were on a fairly boozy World Series writers’ charter from Philadelphia to Kansas City at the time, and he gripped both arms of his seat, leaned forward, and spat out one word: "Never." Granted, it doesn’t help Gordon’s credibility that she’s got her years mixed up. The ’79 World Series featured the Orioles and Pirates, not the Royals and Phillies. But in fairness, this book is far from some sort of screed against Baseball. For every story about a player or team official or fellow writer who treated her poorly, there’s a story about one who was kind. The book is good-hearted toward both baseball (which she clearly loves) and Baseball (about which, understandably, she’s got mixed feelings. One question I couldn’t help asking myself while reading: Why not Alison Gordon for a posthumous J.G. Taylor Spink Award? It’s telling, perhaps, that the most joyful section of the book concerns Gordon’s APBA baseball league. (APBA is, as I understand it, a lot like Strat-o-Matic Baseball, which is itself sort of a cross between Yahtzee and an Intro to Statistics course.) She adores her team, the Simpson Avenue Studs, and is unabashedly enthusiastic about the range of baseball vicissitudes contained in the cards and the dice. APBA is baseball; Dave Stieb and his temper are Baseball. I am certainly in favor of giving Alison Gordon a posthumous J.G. Taylor Spink Award on the basis of this book. Fall Balls! (Foul Ball! in my American version of the book, published by Dodd, Mead and Co., a house that unfortunately no longer exists) provides as vivid a portrait of baseball in the late seventies and early eighties as I can conceive of existing. Who do we contact to get the ball rolling? Could I get you to talk a bit about how the game that Gordon describes is different from the one we see today? I know she must have approved of the wave of new stadiums; she frankly calls the Metrodome and the Kingdome "horrible, sterile places" and posits that the Twins and Mariners teams of the era are so bad because they are depressed. Do you think players are different? Do you think she might like reporting on today’s game a bit better than the one she reported on? Rob: I think she might enjoy covering today’s players just a bit more … but just a bit. There are still plenty of arrested adolescents in the locker rooms, and while Baseball seems more tolerant of the occasional oddball — which is to say, someone who enjoys books without pictures — if you read Dirk Hayhurst’s books, you know that conformity, sexism, and thoughtless churlishness are hardly relics of the past.